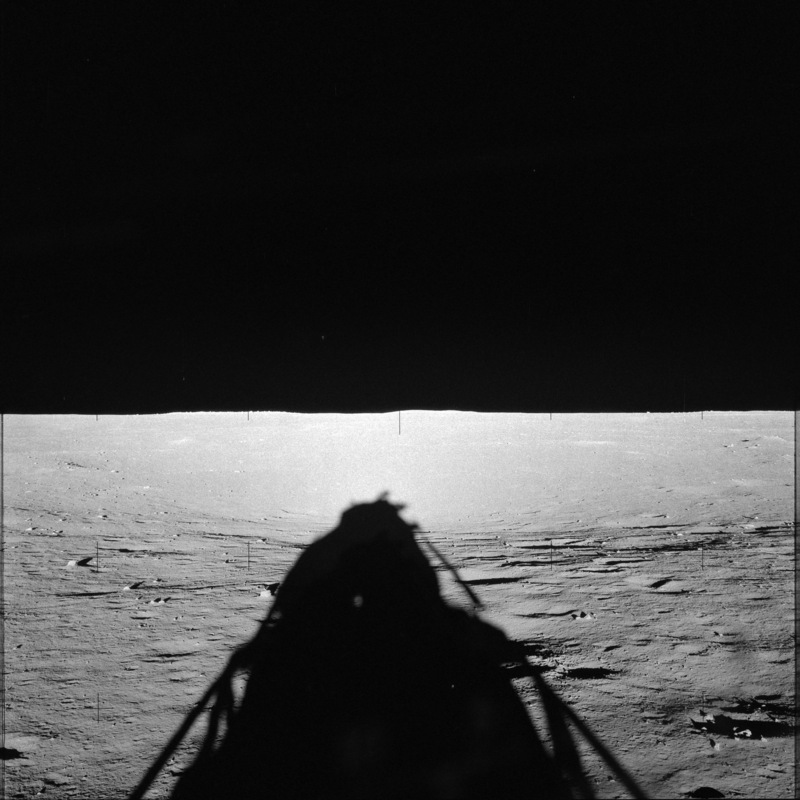 Apollo 12 landed at 06:54 on 19/11/69 and as with Apollo 12 completed a series of post-landing checks before getting photographs out of the window so that they would have something to show for the trip in case of abort. 112:14:12 Conrad: Okay. Then I'm judging about right. The times from the transcript equate to about 08:30 GMT, which is the time recorded in the ALSJ for the recording of the first photographs. The sun angle at this time would be around 6 degrees, which would give a shadow length of 66.6m. 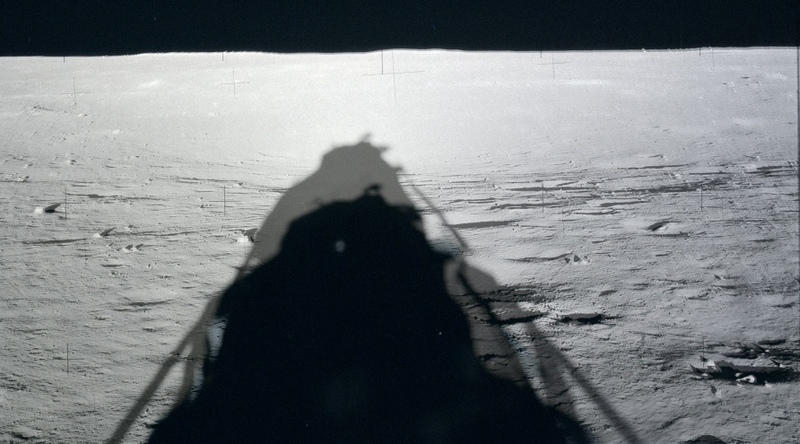 Houston’s estimate of shadow on level ground is accurate for the time of landing, but not the time of the conversation. They’re slope adjusted figure amounts to 45.7 m.
So, what could Conrad see out of the window and how does the actual shadow length match up with predicted? The image below is a crop of this panorama, and I’ve put it next to the LRO image of the same area. In order to help confirm the distance I’ve identified specific features with coloured arrows. So how long does this equate to in distance terms? Here’s how it looks when the LRO image is placed in Google Moon and measured. 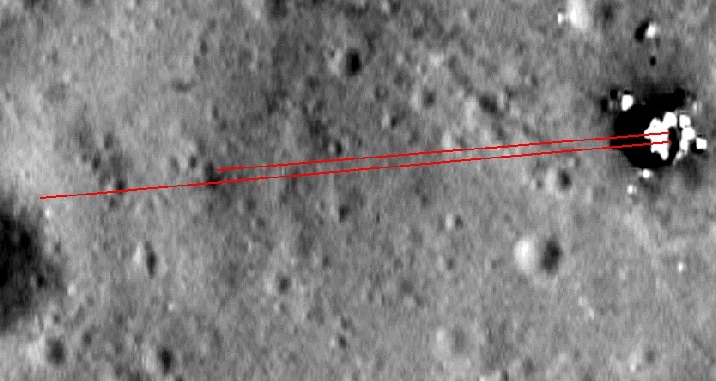 The long red line is how far the shadow would reach on level ground, the shorter one is how far it actually reached - 47.7 m based on my estimates from the craters visible in the photographs, very close to Houston’s estimate of shadow length on a shallow slope. It’s worth pointing out that the LM shadow is most definitely not reaching the larger crater visible on the left, as this would be in shadow, and the depression in which the LM shadow sits clearly is not. So we have the same issue here as we did for Apollo 11 - is the ground sloping. The photographic record is ambiguous, and there is little to indicate one way or the other. We do have one quite generous clue present in the panorama used above, namely that the crater on the left of the image above is not visible in any way. 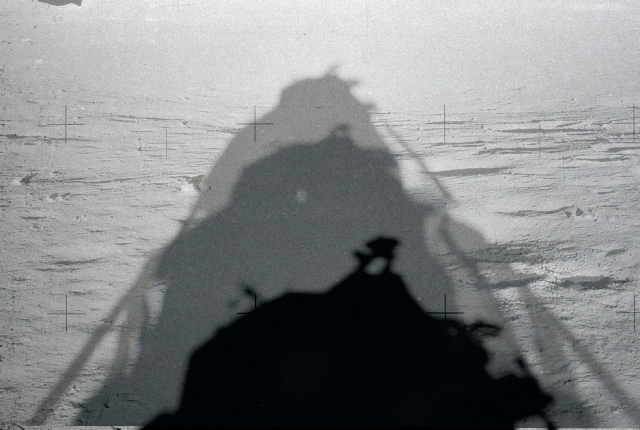 The impression from the photographs is that the surface rises away from the LM, then slopes downward into the depression in which the end of the LM’s shadow sits. Mission Control are certainly happy, using their Lunar Orbiter derived maps, that there is an upward slope and their estimates are consistent with what we actually see. So, having established that the LM shadow length is consistent with what we would expect for the pre-EVA photograph, what happens over the course of the mission? There are two EVA’s on this mission, and they both have post-EVA photographs to compare with the first ones. The images taken after the first EVA was done at 16:30 on the 19th. This would give a shadow length of 39.7 metres in an ideal level world, based on a sun angle of just over degrees. The photograph shown below is one of those images (AS12-46-6854) overlain by AS12-48-7024. The two images have been aligned on the craters and rocks that we can see in them and it is quite obvious to anyone with eyes that the second shadow has moved towards the LM as the sun has risen in the lunar sky. A rough estimate would place the shadow at 31.9 metres, based on it ending about level with the crater identified by the black arrow in the previous image. 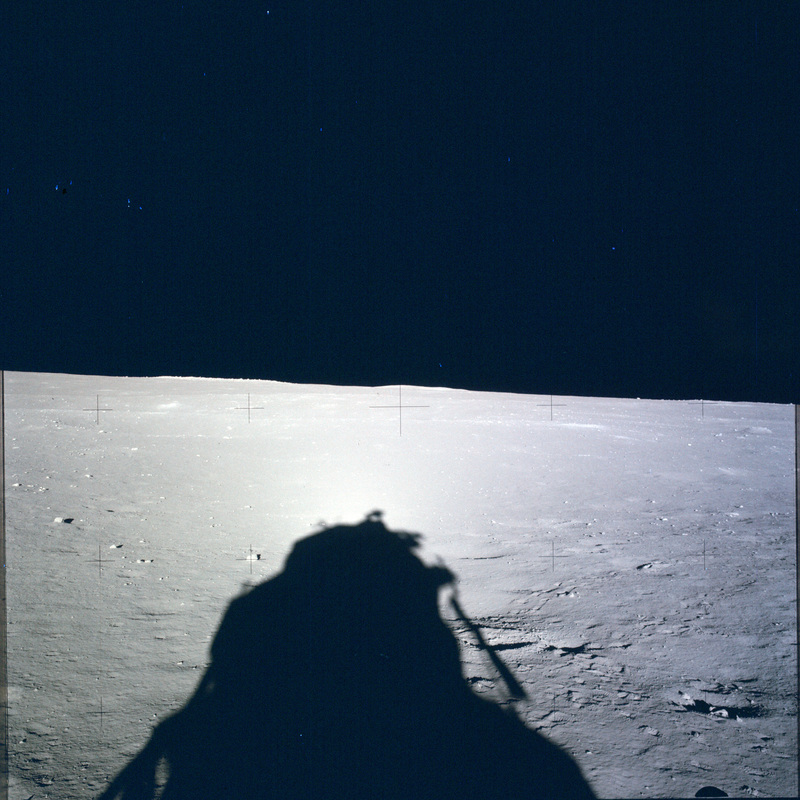 The photographs taken after the second EVA were taken, according to the ALSJ, at 08:30 on the 20th, and by now the sun angle has increased to just over 18 degrees, which should give us a shadow length of 21.8m. Using AS12-48-7157, we can see how this has moved the shadow relative to the other two shots from the LM. The length on level ground at this time would be 21.8 m, but based on the position of the crater marked by the light blue arrow in the used earlier, the actual length is around 17.5 m, and again it is clear that there has been definite and obvious movement of the shadow over the course of the mission. We also have images of the crater itself showing how the illumination conditions changed over their time there, and initially Surveyor was barely visible at all. The upper of the two images below is part of a panorama taken at 118:27:12 in the mission, while below that is from another panorama taken at around 134 hours. 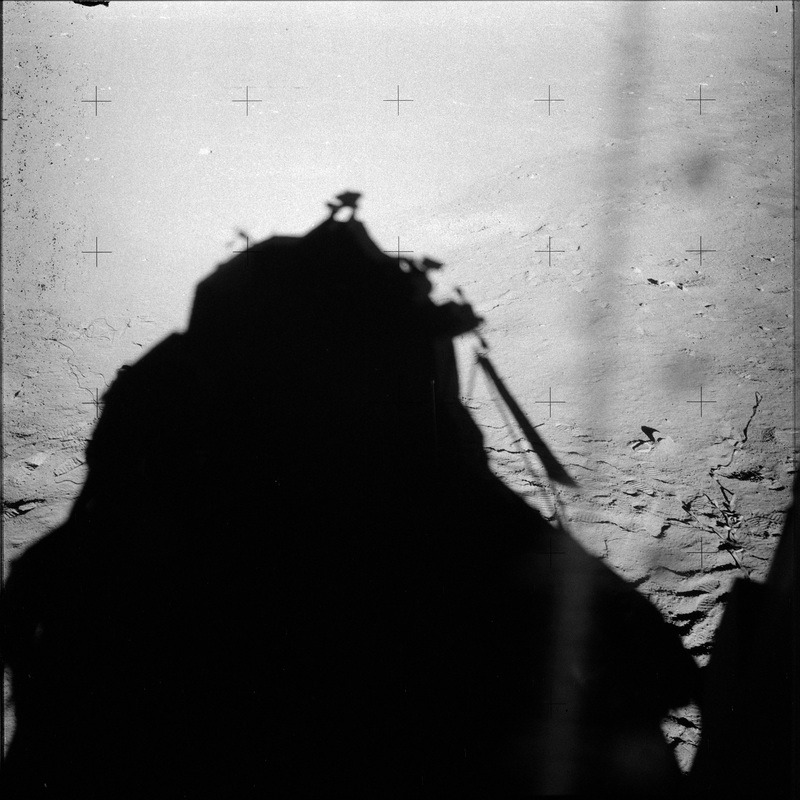 It should be pretty plain that early in the mission almost half of surveyor crater was in shadow, compared with it being completely sunlit later on, something completely consistent with the mission timing and the fact that Apollo 12 was on the moon.